First off, love the new look of the website! Well done, I might have to hire the company that did it for our new website. Just had a quick question if anyone here has any feedback for offering discounts for military, teacher, police, student, etc and if so, do you mind sharing? We have a university and hospital not too far from us and would like to recruit more customers and figured this might be a possibility. You could do a discount for them, but more importantly, how are you marketing to them? It doesn't make any sense to offer a discount if they have no way to know about it. Generally, I shy away from giving discounts to specific groups like that. I have Garmin world HQ around the corner from me, and have a lot of customers from there including Garmin's company fleet. The only difference between them and people in the neighborhood that you might send coupons to, is how you get the coupons in their hands. That's going to come down to internet marketing mostly. Get your web provider to target searches to the hospital and university. Also check with the HR department at both. See if they'd like to include a "special offer" from you as a benefit. The offer could be exactly the same coupon as everyone else gets, but labelled differently. That way you don't have to set up anything special for them, but you can still track it easily. I also do not care for discounting as a means to bringing in new customers. If this is all you have of value to offer then the next guy who lowers his price will surely win them over. Another way you could drive new customers from these organizations is to offer them something of value which might enhance what you already do such as a car wash with any service or maybe giving them a better or longer warranty with all of their repairs. Something that makes you stand out and shows more creativity than $$ off. I'm not saying that you shouldn't use a discount to attract new customers. I send 15,000 mailers a month with cheap oil changes and tiered discounts. Been sending them for almost 5 years straight and it's still working. My point was that he needs to think about how to best get the ad in their hands. Many traditional marketing methods don't work because you can't exactly mail to them. If you can't make them aware of your service, or a discount to incentivize them to come in, then all the discounts in the world won't matter. I also loath discounts. I have no advertised discounts right now and we're staying busy. I'd go with what wheelingauto said. Offer something of value. Free pick up and delivery? Car wash with any service? Longer warranty? Shuttle service? I'd also look up if they have a 'national nurse day' or something like that. I'd make sure to send tons of cookie trays, goodies, and business cards on that day to the hospital. I'd also look into a teacher day or do a school supply drive for the university. Or see if you and your crew can do a volunteer project at the university... Anything but discounts. I'm trying to figure out your aversion to offering a discount to bring in customers, but you are willing to spend money on other things that are much harder to track their effectiveness. I'd rather give a $10 discount on an oil change, be able to track what exactly brought the customer in, and what my ROI was on that offer, than spend $15 washing their car and not having a clue how effective it was. You're very fortunate to be staying busy while offering no discounts, and if that's working for you then it's a boost to your bottom line. But the original poster is looking for ways to market to a few specific groups, one can only assume that he's not happy with his current car count and sees those groups as an opportunity for growing his customer base. There are very few ways that I know of to rapidly pay for an advertising campaign than to offer a strong incentive to come to the shop. The items of value are nice and certainly enhance the customer experience once they're in your shop, but they don't drive people to act. If you're wondering what I consider a strong incentive, my current mailer coupon has a full synthetic oil change for $29.95. No trick or gimmick about it, just a full synthetic oil change for under 30 bucks. I don't even keep regular oil or a blend in the store. My ROI for that coupon is 680%. What's the ROI on a free car wash with every service or a longer warranty, and how do you track it? What kind of oil do you use with that offer? Are their up charges for more expensive filters on some cars? What if people do not want to put synthetic in their car? The oil is a dexos approved house brand from our oil vendor. My oil filters are also a house brand from Factory Motor Parts. If the customer wants anything else, or if it's a european car that needs a euro spec oil, it's going to cost a hell of a lot more. Of course diesels of any kind are not included. If the customer shows up with the coupon for euro or diesels, I kindly explain why I can't do that, but then discount their oil change by the amount of discount that the standard oil change people get. Never had a complaint. If the car is a run of the mill car that happens to have a weird and expensive filter, I'll generally eat it. I more than make up for it by being able to inspect their car and sell them needed services. I've had a few people ask about using a non-synthetic oil. We just explain the advantages of using a full synthetic, and that if they really want regular oil, we can get it for them at a higher cost. No one has asked to pay more money for worse oil. Almost forgot the best part about my 29.95 full synthetic oil change. I used to run a 19.95 coupon oil change with a synthetic blend. Now with the full synthetic oil, I make $5 MORE per coupon oil change. I still don't make much, but I went from trading dollars to actually making a small profit. And I'm still $15 cheaper than the standard oil change at Jiffy Lube. Have you tried other price points? Seems like a $39.95 full synthetic will be a great bargain. You are a head of the curve on offering only full synthetic. The Dexos standard is being revised and will be for full synthetic oil by August according to Valvoline. Have you tried other price points. Seems like a $39.95 full synthetic will be a great bargain. You are a head of the curve on offering only full synthetic. The Dexos standard is being revised and will be for full synthetic oil by August according to Valvoline. I just started with the full synthetic only oil changes in January, so I haven't tried other (higher) price points. But why would I? The point of a cheap oil change is to bring customers in the door. I want my offer to be so good that they can't possibly pass it up. For most people, oil is oil. They have almost no understanding of the difference between full synthetic and a blend. If my coupon oil change can be almost $20 less than Jiffy Lube, then I'm good. If the price is similar, even if I'm offering better oil, the average customer can't tell the difference. If my sale price is close to what an oil change "should" cost (in their mind) the automatic assumption is that I'm overpriced in general and would overcharge them (again, in their mind) for a brake job etc. What kind of response is that offer bringing you versus the offer you were running prior to January? So far, exactly the same. Time will tell, but so far so good. February had just over 90 coupons and 33K in sales after discount. I'll take it. I have used the coupon price to "throttle" the response in the past. If I was too busy with oil change customers, I simply raised coupon price $5. But that was before I had fully staffed my shop, and I haven't had to do that in quite a while. MY aversion to discounting is derived from my experiences. First off, to offer something at a loss (your losing money at $29.95) you must find something wrong and successfully sell it to make a profit. What differentiates you from anyone else offering a cheap oil change? If they came to you for a full synthetic $29.95 oil change will they go to your competition for a $27.95 full synthetic oil change? Whats the value proposition? I can and do track every new customer though the door. Most are referred or have found us through reputation. I can do a very complex and expensive repair on a car, the owner had no idea what I've done or how I've done it. They walk out and see a clean shinny car and it makes them feel a sense of pride or at least good about their car. They can see something was done. When asked about what makes us different I dont talk about my $29.95 oil change. I talk about doing things the right way, not cutting corners and standing behind them for 3 years or 36,000 miles.....nationwide. ROI on free car washes and longer warranty cam be tracked in customer retention, avg ticket, sales growth and net profit. Just curious, how many of the 90 were existing customers vs new. What were sales to new vs existing? To your first point, I'm not losing money at 29.95. Unless you know my costs, you can't say whether I'm losing money or not. What differentiates me from anyone else offering the cheap oil change is the full inspection on the vehicle, and knowing that the service was done correctly by qualified technicians. Most of my oil changes are done by my lube dude (to keep costs down) but 4 of my 6 techs are ASE masters. You don't get that at Jiffy Lube. I also track all my new customers, and I track my existing customers. They're not cheap. My average RO last year was $428. That's every single repair order including oil changes, and even including $0 tickets. Everything. I agree with you that there's value in washing a customer's car after a big repair, and we do that on big jobs like engines and transmissions. I would do it more if I had a wash bay in house. But the premise is bringing in new customers. Potential new customers can't feel good about a car wash until after they've been to your shop. I agree that I've trained my customers to look for the discounted oil change. I'm happy about it too. They look for my LOF coupon, act on it, and spend $428 on average. So I make a very small profit on the LOF, and since the average car we see is 10 years old with 150K on the clock, we sell them an average of $400 in additional repairs at 62% GP. My sales have grown from 770K six years ago to 2 Million last year. How's your growth doing? That spreadsheet is on the bookkeeper's computer and she's shut it down and gone for the day. I can tell you what I average, and that's about 30 new customers on the LOF coupon monthly. The spreadsheet doesn't break down new customer sales vs existing on the coupon, so I'd have to go through it. I do know that new customer average RO tends to be pretty good since we've not seen and inspected their car before, so there's more wrong with it. I really don't care much about new customer sales vs existing on the coupon. I care about how many people have been incentivized to come into my shop, and what marketing piece did the job. I don't know how many times I've heard people say that once you've marketed to someone and got them as a customer, then you can remove them from your marketing. They say once you've "built up your customer base" you can stop the marketing all together and save the money. I call BS on that. Do you know one single human being over the age of 5 who has never had a Coca Cola? Ever seen a Coke ad? I mean, they've built up their customer base haven't they? Why do you suppose they still spend so much as a dime one marketing, much less millions? Sorry guys if my responses have been a little on edge. Phones have been going up and down for the last 3 hours and tech support has been less than helpful. How many bays and is the total sales one location? My biggest problem is having bay space and adequate staffing to really work at incresing car count. It is one location. I bought my building in 2011 when the commercial real estate bust caught up to the residential bust. It was on sale to say the least. I was looking to build an 8 bay shop down the street from where I am now, but instead I got 21 bays for $100K less. We only use one side of the shop (11 bays) but we keep inching toward having to put lifts in the other side as well. We're spoiled with so much space, and all my guys know it. That said, I've seen some shop owners manage to pull off some incredible numbers from a tiny location. It takes better organization skills than I possess, but it's possible. The most efficient shops I've seen run one bay per tech. I have no idea how they manage to do it day in and day out. When I first read your response I puffed up my chest and was about to rip out a lengthy response. I went back and read thru the thread and I had responded to the questions you asked about tracking and response on value based items. I guess I can see how you may have taken that as a challenge to your positions/beliefs and I apologize for that. I in no way meant this to be an argument or even imply one side has more merit than the other. I do however enjoy a spirited debate on shop operations so I will respond to your points about one at a time throughout the day as I get time. Boy wouldn't I love to have your place at my location. I pay $2.29 a qt for house brand synthetic oil from Keltners. add a $2 filter and you have $13.45 in raw materials for a 5 qt oil change. Your lube dude I suppose can be had for as little as $8 an hour although in my neck of the woods he/she would cost several dollars per hour more. Add in cost of employment at 20% and we are at $10 an hour. Oil change with inspection takes 30 minutes so that's another $5. They say when you take a tech off task he looses .2 plus the time he's off task. To do a quick look over even without accounting for the .2 to get back on task you have .2 and a master tech @$30 an hour $6. If the mast tech does not look over the car then you lose the value statement made above. You belong or used to belong to a 20 group. They all cut up the pie differently but it's still all a pie. My training tells me benchmark for expenses is 40%. @ 2 mil @40% is 800k. 11 hours a day 6 days a week is roughly 3377 hours. 800k divided by 3377 is $236.89 per hour. 236.89 divided by 7 bodies is $33.84 per hour per body. While you may be making gross profit I doubt you are making net. General repair shops do not make money on oil changes. The point I was making is a lot of people understand that you are at best breaking even on an oil change. In order to make a profit you MUST find something wrong with their car. I think this is a poor way of initiating a relationship with a new customer. It can lead to resistance. I get this. I also run a facility that makes these claims. Jiffy lube states they are vehicle maintenance experts. Pretty impressive. Your lube dude may be more qualified than the kid a JL but really how much more? And do you have a valid measuring stick? All that being said, I am saying when you introduce price to the offer the rest looses the limelight. Everyone says they have ASE certified techs, great warranties blah blah blah. The people are responding to the price. See above Psychology thoughts. Excellent numbers, I was not comparing you numbers or your results. I was stating one can measure successful marketing campaigns without coupons by tracking those metrics as well as others. The value in washing a car is immeasurable. When someone gets an oil change there is absolutely no difference in how the car operates. The owner is much happier when it's clean. The warm fuzzies created when asking a customer if they have time for a wash when the service is completed is a reward in itself. Many people state they come in for the car wash and the oil change...meh...no one gets exited for auto repair. This is my point. You've trained you customers to wait for service until they've gotten their coupon. You also are training them to pay attention to price by focusing on it. Studies show people choose auto repair providers do so for top 3 reasons, trust, expertise and convenience. Price is always 4th or 5th on the list. All I am saying is I think we should focus on the strengths we have and bring in new as well as retain customers on those top 3 things. If we bring price to the forefront aren't we telling them it should be more important than it is? And if so how long until your competition does it cheaper because they cant to the top 3 right? If all they have to offer of value is cheap they reap what they sow. And this is the whole point of my argument. I am not saying what works for you does not work, I am saying it does not work for me and letting others know there are other ways. Imagine if we raise the bar for the whole industry how much higher we can raise our own bar? I cant tell you how awesome this is. I love to see shops reach their potential. Imagine if every discussion you had made you think as much as this one. And you still have another half of a facility to grow! My business is really good, but I've been at it a long time. Thanks for asking. Again, I apologize for my tone yesterday. Phones going up and down for hours and sitting at my computer while tech support does little to nothing about it made me more than a little irritable. I probably shouldn't have been on a forum of any kind. No, I don't intend to make money on the oil change. You're right, it's a very small GP on the coupon oil change, and no net. But that's not the point of the discount coupon. The point is to get people in my door, and to make sure that I'm the facility that takes care of ALL their automotive needs. I never want them to have a reason to go elsewhere. Not even for an oil change. 1. The new customer comes in for an oil change, coupon in hand. You tell them you'll get right on it. You write the repair order and move the car in to your lube dude. You either have a competent lube dude do a good inspection, or have one of your techs do it. 30 minutes later, the RO makes it's way back to the service desk with a $1000 list of needed repairs. You bid the jobs, taking another 15 minutes, and present them to the customer. The customer is shocked, and feels like it was all a bait and switch. He's also impatient because he believes you should be done by now. The customer declines all repairs and you never see that customer again. 2. The new customer comes in for an oil change, coupon in hand. You tell them you'll get right on it, and "while your car is here, I'll have my technician look the car over and make sure everything else is OK for you." The customer replies "Thank you, that would be great." The next few pieces of scenario 2 plays out exactly like scenario 1, except that you've now set the expectation with the customer that you're going to inspect the vehicle, and present your findings to them. In other words, you have permission from the customer. Also, by using the words "... make sure everything else is OK for you" you've set yourself up as their assistant, not just someone looking for a sale. Now instead of the customer being irritated that it's taking so long, they know you're doing more than just the LOF. They all know there are things wrong with their car, and aren't surprised when you find them. It's getting permission to find them that makes all the difference. To conclude scenario 2, the customer approves 50-60% of the recommended repairs. You tell him the car will be done this afternoon, and offer him a ride home. Try using those exact words (I can't stress this enough) for a week or so, and do great inspections. I bet you'll change your mind about oil changes in general, and maybe see why I like giving them away for no net. Psychology is important, but it's as easy to make it work for you as against you. I can't begin to tell you how much better my life is than it was 6 years ago. 6 years ago I had been in business almost 15 years. I was very much in the same school of thought as you are regarding oil changes and discounts. The shop was working for me well enough to be able to buy my new building (I did own my old building too). With the new building came a lot of expenses, and I had a lot of bays I needed to fill FAST. I tried a few things that were not too successful. I was growing, but not nearly fast enough. Money got tight really fast. A year after moving into my new building, I bit the bullet and actually went into a little debt to launch my mailer campaign. I joined my 20 group 3 months later, and my facilitator tried to get me to lease a portion of my building to reduce my rent factor, and told me to cut down on the marketing expense. I said no, and no. He also said I should consider removing current customers from my mailer list. Again, no. I got bitched at constantly because my expenses were too high. I don't think my facilitator or other members could see how I was going to become profitable. I told them I was going to sell my way out of it. Impossible they said. Challenge accepted. My biggest regret in business is not marketing my old location as much as I'm marketing now. It was something I thought I couldn't afford. Now I see that I can't afford not to. For every dollar I spend on my mailers, which is my lowest ROI piece, my customers give me $6.80. I'll take that all day long, and I'm not going to judge the people handing me money as being "cheap" for using a coupon. My hat is off to you as you can't argue with success. However, may I ask if you have 1-2 bays totally dedicated to the oil change business and were these set up as quick lubes? Second, would you modify your advertising if your facility were as small as your former building? Do you do the oil change business as walkins or appointments. 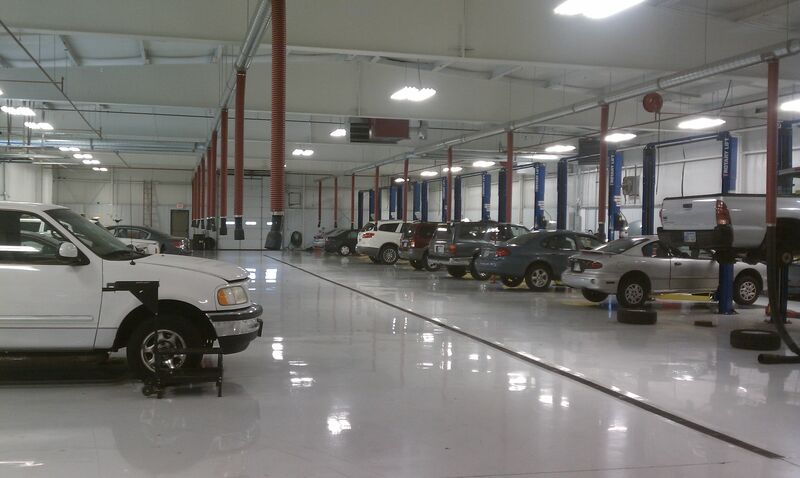 My problem seems to be not enough bays, too many big jobs, technicians too inefficient, etc. to take advantage of an increase in car count. Or maybe the problem is just my management ability. A couple of times I have staffed up and was ready to try to move our business beyond $1,000,000 but both times my help situation subsequently imploded. The last two years I have found it extremely difficult to find good people even hiring some I didn't really want to due to having to have somebody. My hat is off to you as you can't argue with success. However, may I ask if you have 1-2 bays totally dedicated to the oil change business and were these set up as quick lubes? Second, would you modify your advertising if your facility were as small as your former building? Do you do the oil change business as walkins or appointments. My problem seems to be not enough bays, too many big jobs, technicans too ineffecient, etc. to take advanatage of a increase in car count. Our maybe the problem is just my management ability. A couple of times I have staff up and was ready to try to move our business beyond $1,000,000 but both times my help situation subsequently imploded. The last two years I have found it extremely difficult to find good people even hiring some I didn't really want to due to having to have somebody. I don't have bays set up as quick lube only. I have so many racks available that finding the space is not usually a problem. My lube dude uses the 4 post drive on most of the time, but if I have a truck that needs it, the truck gets it. Technician efficiency can be fixed. There's no better manager than a proper pay plan. Plus if you can start tracking their time they'll magically become more efficient. Finding good people is another matter. I don't know anyone who's having much luck lately. We've been hearing about the coming technician shortage for years. I think it's here. My problem seems to be not enough bays, too many big jobs, technicians too inefficient, etc. to take advantage of an increase in car count. Or maybe the problem is just my management ability. A couple of times I have staffed up and was ready to try to move our business beyond $1,000,000 but both times my help situation subsequently imploded. The last two years I have found it extremely difficult to find good people even hiring some I didn't really want to due to having to have somebody. One of the biggest challenges we have in this industry is finding qualified help. What is a highly qualified, efficient tech worth? Most management gurus say put them on flat rate and they earn what they earn. Yes if they become plumbers they spend a fraction of their own money on tools and equipment and are guaranteed great pay for every hour they are on the clock. If your a tech at an average shop your pay is affected if the owner does not know how to market, does not charge correctly or makes you pay because he gives something away. Its a crappy system and we loose quality people every year because of it. We have relied on flat rate for too many years to cover up our inability to manage and correctly operate a business. In addition, we do not properly value what we do and charge accordingly. We knowingly sell stuff at cost to try to get opportunities to sell something to try to make a profit or we attempt to compete at the bottom of the spectrum. One of the exercises you should go thru is figure out your current capacity and potential capacity. Your focus needs to be on tech efficiency and effective labor rate. Most of the time we do not need more techs, we need to keep our techs producing at full rate and not performing other tasks. Them ore money we can capture without adding capacity the more we can pay the better the quality.